A recent report published by Infinium Global Research on plastic waste to oil market provides in-depth analysis of segments and sub-segments in global as well as regional plastic waste to the oil market. The study also highlights the impact of drivers, restraints and macro indicators on the global and regional plastic waste to oil market over the short term as well as long term. The report is a comprehensive presentation of trends, forecast and dollar values of global plastic waste to the oil market. According to the report the global plastic waste to oil market is projected to grow at a CAGR of 13.2% over the forecast period of 2018-2024. The world is facing various environmental related problems mainly caused due to plastic and plastic waste. Out of the total plastic waste, a very small amount of plastic gets recycled and the remaining plastic is fragmented in the dumping ground or in the sea. The waste plastic can convert into the oil that can be used for both domestic and industrial purposes. The process of converting plastic into the oil is based on similar chemical technology that is used for thermal cracking. In this recycling process the plastic is firstly undergone through a cleaning process to remove dirt or food and after that, it is heated up to 500 degrees Celsius. The heating breaks down the carbon bound and produces three different products as Oil, Carbon Black, and Hydrocarbon Gas. The huge production and the consumption of plastic across the world is the key driving factor of plastic waste to the oil market. The generation of plastic waste is rising rapidly across the world that further creates a large number of un-recycled plastic. In addition, the growing use of oil produced from plastic waste across the various domestic and industrial are likely to boot the growth of plastic waste to the oil market. The oil produced from the plastic is used as industrial diesel, in the electricity production, and in lubricant formations. Furthermore, the growing awareness about the use of plastic in the formation of usable oil and growing government’s inclination towards the waste plastic to oil production process contributes in the growth of global plastic waste to the oil market. Moreover, the rising awareness about environmental pollution and strict government regulations regarding plastic are expected to create more opportunities for plastic waste to oil market over the forecast period. Geographically, North America holds the maximum market share in the plastic waste to the oil market and expected to remain the dominant region over the forecast period. The strong government policies and increasing adoption of new technologies are the factors driving the growth of plastic waste to oil market in the North America Region. Furthermore, Asia Pacific is the fastest growing region in plastic waste to oil market owing to the high demand of fuel for transportation and industrial use and rising investments and adoption of oil production from the plastic waste. The report on global plastic waste to oil market covers segments such as type, technology, and end-fuel. On the basis of type, the global plastic waste to oil market is categorized into polyethylene, polystyrene, polyvinyl chloride, polyethylene terephthalate, and polypropylene. On the basis of technology, the global plastic waste to oil market is categorized into catalytic depolymerization, pyrolysis, and gasification. On the basis of end-fuel, the global plastic waste to oil market is categorized into diesel, kerosene, synthetic gases and gasoline. The report provides profiles of the companies in the global plastic waste to oil markets such as Nexus Fuels LLC, Plastic Advanced Recycling Corporation, Cynar Plc, Vadxx Energy LLC, Clean Blue Technologies Inc., RES Polyflow, MK Aromatics Ltd and Agilyx Inc. The report provides deep insights on demand forecasts, market trends, and micro and macro indicators. In addition, this report provides insights on the factors that are driving and restraining the global plastic waste to the oil market. Moreover, IGR-Growth Matrix analysis given in the report brings insight into the investment areas that existing or new market players can consider. The report provides insights into the market using analytical tools such as Porter's five forces analysis and DRO analysis of plastic waste to the oil market. Moreover, the study highlights current market trends and provides forecast from 2018-2024. We also have highlighted future trends in plastic waste to the oil market that will impact the demand during the forecast period. Moreover, the competitive analysis given in each regional market brings insight into the market share of the leading players. 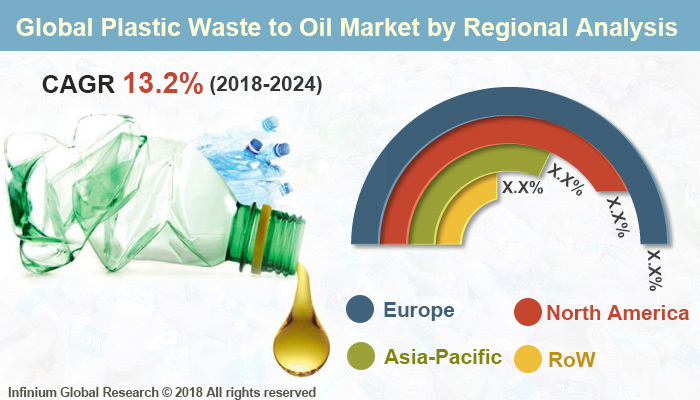 This report will help manufacturers, suppliers, and distributors of the plastic waste to oil market to understand the present and future trends in this market and formulate their strategies accordingly.